AT LEAST three prospective Gympie Cup candidates emerged from last Saturday's Gympie Times Ladies Race Day. The Pat Duff-trained Fasta Than Light recorded his second win over 1470m in two Gympie starts and looks an ideal front-runner type for the Nationwide Civil Gympie Cup over 1600m on October 24. The other two likely Cup candidates are last season's Gympie Horse of the Year, Foregone, and Unique Fuse, both placed behind Glenthorn Avenue in the 1170m Open. Unique Fuse had been second in the 1608m Gladstone Cup in August while Foregone was a sound third to Noogoora Burr in the 1600m Gympie Muster Cup. Pat Duff, now one of Brisbane's most respected trainers, won the Gympie Cup back in 1968 with Papilloma, who was raced by Gympie identities Ted Fisher, Bill Bishop and Bill Webb. Pat was then training at Wondai, the site of the Duff family property, prior to his move to his now Deagon base. This year's Gympie Cup carries total prizemoney of $19,000 with a six-race card on Cup day which coincides with the Cox Plate in Melbourne. Proston trainer, Lindsay Anderson was elated to win another race in Gympie last Saturday with stable star, Glenthorn Avenue, but had another reason for excitement in the shape of two-year-old Cash Dash. This Dash for Cash youngster topped this year's Capricornia yearling sale when knocked down for $50,000 and is the likely favourite for Saturday's $100,000 QTIS Two-year-old at Doomben after his impressive nine-length win in a two-year-old trial at the Gold Coast. Lindsay presented the horse at the Rockhampton yearling sale. The colt was out of the Exceed and Excel mare, Letter from France who was unplaced in two Victorian starts before being sold for $3000. In his trial, Cash Dash ran 56.09s for the 900m on a soft track, while the fastest time recorded by Open horses on the day was 55.18s. Cash Dash was purchased in Rockhampton by Peter Malpass and Col Donovan, the owner of top sprinter Our Boy Malachi and was the top-priced yearling sold there. 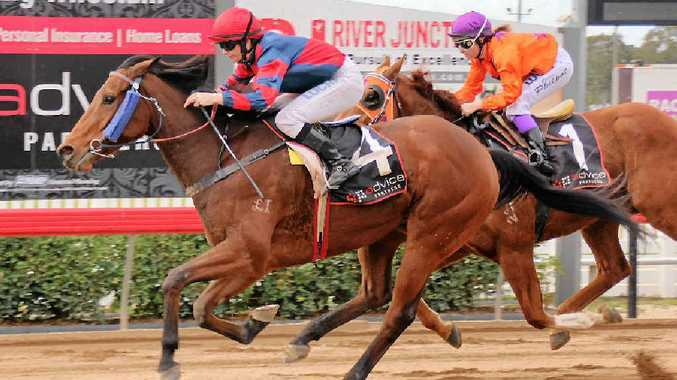 The youngster is trained at Beaudesert by Stephen Jones and is likely to go on to contest the $100,000 Capricorn Yearling Sale Two-Year-Old Classic in Rockhampton in April. Former jockey Col Fedrick was back in Gympie on Saturday in a steward role after several decades away. Col, who rode at the South Side track in the late 1960s, has been stewarding in Brisbane and at Caloundra for several years, but last Saturday was the first time he was rostered in Gympie. Gympie apprentice Billie-Rose Derbyshire is currently on loan to Gatton trainer Brenton Andrews from the Kerry Munce stable. She completes her apprenticeship in December and is on loan until that time, although she is hopeful of obtaining an extension to the apprenticeship. She still claims 3kg at the provincials and started her apprenticeship a little later than usual. Kilcoy stages a TAB meeting tomorrow with last-start Nanango 800m winner Jeptoo to contest the first heat of the Cannonball Series over 800m. The Brad Hudson-trained mare will carry only 55kg with the apprentice Faith Elliott's 3kg allowance. All going well Jeptoo should get through to the $30,000 Final to be held at Kilcoy in December. Glenthorn Avenue is engaged at Kilcoy in the 1200m BM 70 with 60 kg. Veteran Gladstone-trained galloper Blaze to Fortune was last Saturday's $10,000 Celebrate Country race on his home track to take his earnings to over $160,000. The French Deputy nine-year-old has won on all the sand tracks in the area, viz. Bundaberg, Gympie Wondai and Gladstone where he has an outstanding record for leading Gladstone trainer, Denis Schultz.